U.S. Mint production jumped in January with the agency’s facilities in Philadelphia and Denver striking more than 1.79 billion coins for circulation, the second most for a month than in any since at least 2007 when CoinNews started tracking the data. The Federal Reserve always orders more 1-cent coins than any other denomination even as it costs the U.S. Mint 1.5 cents to make and distribute each one. The bureau struck a combined 1.076 billion Lincoln cents in January, representing 60.1% of the circulating-quality coins produced for the month. Of note, circulating cents from the Philadelphia Mint have a ‘P’ mint mark for the very first time. This is a one-year-only embellishment. The letter was added for 2017 as a part of the celebration of the U.S. Mint’s 225th anniversary. There were 515.2 million P-Mint cents made in January. Declined 32.9% for America the Beautiful Quarters. 2017 Effigy Mounds National Monument Quarter for Iowa, released on Feb 6. Reported mintages for the 2017 Native American dollars are 1.54 million from Denver and 1.68 million from Philadelphia for a combined 3.22 million coins. Last year’s release ended with splits of 2.1 million from Denver and 2.8 million from Philadelphia for 4.90 million coins. Finalized mintages for Iowa’s Effigy Mounds quarter should be available by March or April. 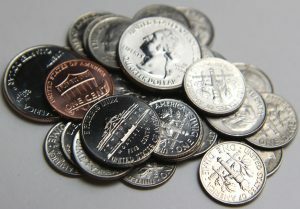 In January, the Philadelphia Mint struck 874.14 million coins and the Denver Mint produced 916.16 million coins. Their combined 1.79 billion total is the most since the 1.807 billion coins came out of presses in July. While unlikely, especially with December’s likely low figures mixed in, if the current production pace stretched through to the end of this year, 2017 annual mintages would reach almost 21.5 billion coins. Last year, the U.S. Mint produced over 16 billion coins for circulation. It registered as the second quickest for a year since 2001, after the more than 17 billion coins were made in 2015. 1 Billion pennies made in January, STOP THE MADNESS, don’t make another…..ever. 3 for everybody in the US, in January alone…..none of which will ever be spent, just given out in change and then put in a sock draw or dropped in the store “need a penny bucket”. The zinc lobby and the Illinois delegation will make sure that we’re the last country on earth to mint pennies. Crane Paper and the “don’t change anything I grew up with, ever” crowd will do the same for $1 bills. Half of the Treasury’s output is taken up with those two wasteful denominations, but vested interests and inertial will guarantee that the folly continues…. I wonder why the Mint didn’t bother to make 1992-P cents for the more sensible 200th anniversary of the Mint? Though I suspect celebrating the 225th anniversary in this way suggests the Mint does not believe the cent will still be around for 2042 (another more sensible anniversary). What the mint thinks doesn’t matter (especially with the SES seat warmers they’ve got there these days) – it’s Congress that makes the decisions about the penny and $1 bill futures. I wrote to Treasury Sec Lew about the appalling lack of competence in the mint’s SES management (i.e. Jeppson) but all Lew did was pass the letter on to Jeppson who then had a minion respond (apparently he didn’t know what to say himself) a further demonstration of his incompetence. Luckily he was forced to resign once Trump was inaugurated. David Motl who has prison management experience and mint financial experience is now the guy in charge, Prison and finance, two fields of experience I know are desperately needed for a manager of a manufacturing facility. But that fits Trump’s style so no surprise there. Will be very interesting to see who he nominates for US Mint Director & if the Senate will just rubber stamp his selection automatically. Whoever it is we can only hope that he will actually manage the mint, give us a full year schedule instead of monthly dribbles and lobby congress to get rid of the penny.